Enjoy sakura year round with this lovely cherry blossom tea set! 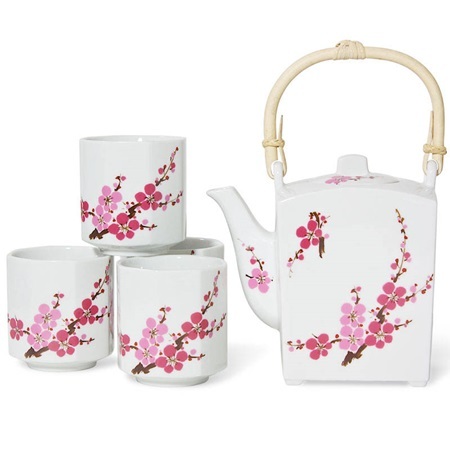 This set contains one tea pot (23 oz.) with stainless steel mesh strainer and four matching teacups (6 oz.) in a gift box. Teapot: 5.75" x 3" x 5.5"h; 23 oz. capacity. Tea cup: 2.75" diameter. x 3"h; 6 oz. capacity. No microwave, Handwash recommended (excluding strainer and handle).